The final text of the Global Compact for Safe, Orderly and Regular Migration (GCM) recognizes disasters linked to natural hazards, the adverse effects of climate change and environmental degradation as drivers that may compel people to leave their countries of origin. With the GCM the states commit to develop disaster risk reduction, climate change mitigation and adaptation and resilience mechanisms to address the vulnerabilities of persons at risk and affected by such hazards and drivers. The GCM also includes a commitment to implement actions to protect human rights and find solutions for people compelled to move in such contexts. This side event will bring together member states and international organizations to present policy instruments and effective practices in promoting environmental, disaster risk reduction, adaptation and resilience mechanisms so people are not compelled to seek livelihoods and housing elsewhere, and effective practices to ensure that migration is safe, orderly and regular when people have to move or decide to move. 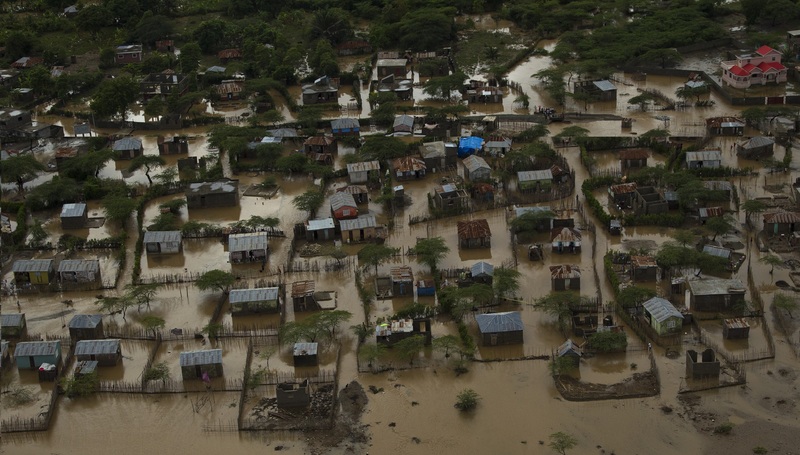 The impacts of climate change on human security are seen in countries across the globe. For instance, changes in rainfall patterns fueled by climate change affect the livelihoods of farmers and pastoralists in Sudan, and risk worsening existing tensions around land and water access. In Somalia, severe drought has impacted deforestation, access to traditional energy sources, and the stability of the country and the region. 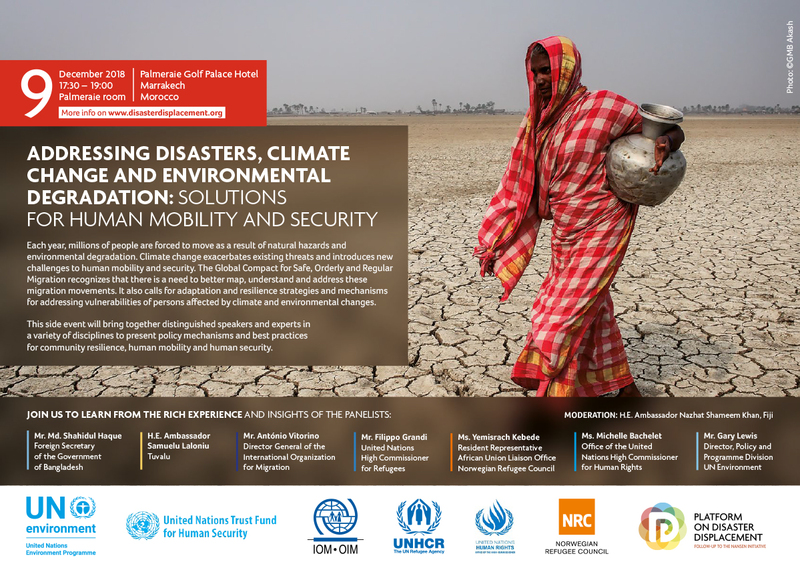 In Nepal, climate change is contributing to extreme weather events such as floods, which combined with underlying vulnerabilities contributes to internal and external migration. However, cooperation on preservation of shared or common natural resources and environmental challenges can build resilience and trust among communities. 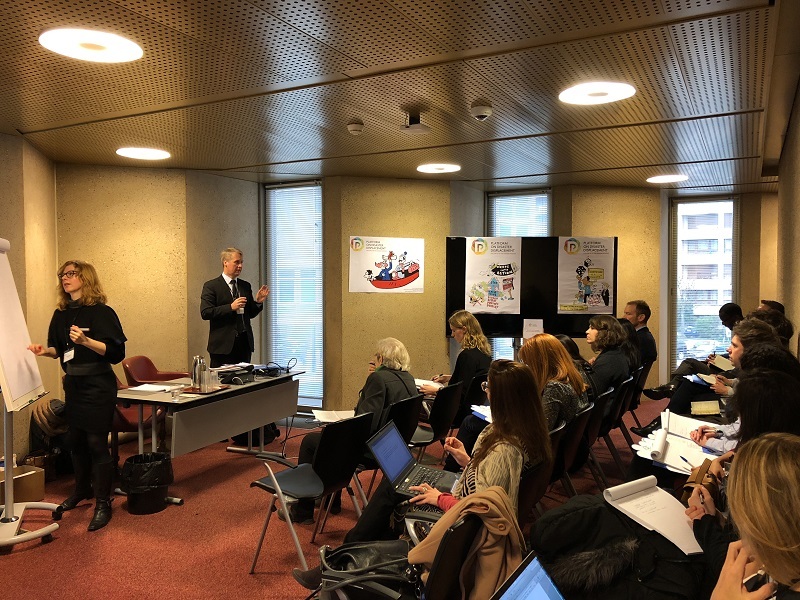 Together, the organizers of this side event are translating their collective experience and insights on migration, climate, environment, human rights and human security risks into operational engagement and action on building resilience and improving relevant policies and management practices. Preventing the foreseeable adverse effects of climate change through best efforts to enhance climate ambition is the best way to minimize the role of climate change as a driver of human mobility. Climate action should be informed by State obligations to respect, protect and fulfil human rights for all persons; climate commitments to protect human health and welfare and to pursue efforts to limit global temperature increases to 1.5°C; and the best available science including the latest IPCC reports and the global stocktake under the Paris Agreement. Early action and support to adapt in place are critically important to avoid protracted migration that could have substantial implications for development and human security – in both sending and receiving areas. Integrated action on climate change, human security and development should be rooted in sustainable livelihoods and equitable use of natural resources. Sustainable livelihoods are also the basis to cope with, recover from and transform climate stresses and shocks. Building trust through shared management of climate-sensitive natural resources can yield the double dividends of climate change adaptation and sustainable peace. Development financing should prioritize projects that promote safe and orderly migration in the context of climate change and projects that seek to avert, minimize or address displacement related to the adverse effects of climate change. Knowledge and data gaps concerning the linkages among climate change, and disasters, and human mobility need to be addressed in order to achieve evidence-based, holistic and protection-oriented responses. Country-level data collection and monitoring as well as modeling are essential for better understanding of these links. Where climate change impacts cause or exacerbate conflict or violence, those forced to flee in consequence will in some cases fall within the refugee definition or otherwise need international protection. In other cases, temporary or humanitarian forms of stay may be warranted including on human rights protection grounds. Further analysis, reflection and discussion on these international protection dimensions are needed. For people living in situations of extreme environmental degradation or in areas particularly prone to serious sudden-onset disasters, states should build on existing practices and consider enhancing the availability and flexibility of regular migration pathways by devising mechanisms for humanitarian visa, temporary protection, planned relocation, ‘migration as adaptation’ or other migration protection tools. Enhance availability and flexibility of pathways for regular migration including those which respond to migrants in situations of vulnerability (objective 5) through humanitarian and rights-based protection measures for admission and stay and solutions for migrants in cases where adaptation in or return to their country of origin is not possible. Regional cooperation strategies that combine policy frameworks and community-based action to address climate change and disaster-related migration, displacement and planned relocation. Promote the outcomes of the GCM conference, the implementation of the compact and the outcomes of the side event among their networks. Facilitation by Ms. Nazhat Shameem Khan, Her Excellency Ambassador Extraordinary and Plenipotentiary.